It is already the end of May and I am beginning to wonder if we will ever see warm weather and sunny days in Minnesota. It has not been a nice spring this year at all. We have had snow, rain and gray skies way too much this year. With that being said a nice bowl of oatmeal is the perfect breakfast these days. It warms you up on these cold gray days and brings a smile to your face. I was looking for recipes when I saw something for peanut butter and jelly oatmeal, it sounded so good that I knew that I had to make it. Peanut butter and oatmeal sounded like a great combination and I like the thought of a little jelly to sweeten up the combination. This recipe is nice also for the fact that it makes a single serving. I actually made two since our daughter Krista came home for part of the Memorial Day weekend and I knew that she would love it. But as for the guys in the house I knew that they would have no interest in this at all. One does not like oatmeal and the other will not eat peanut butter. So the single serving is perfect. 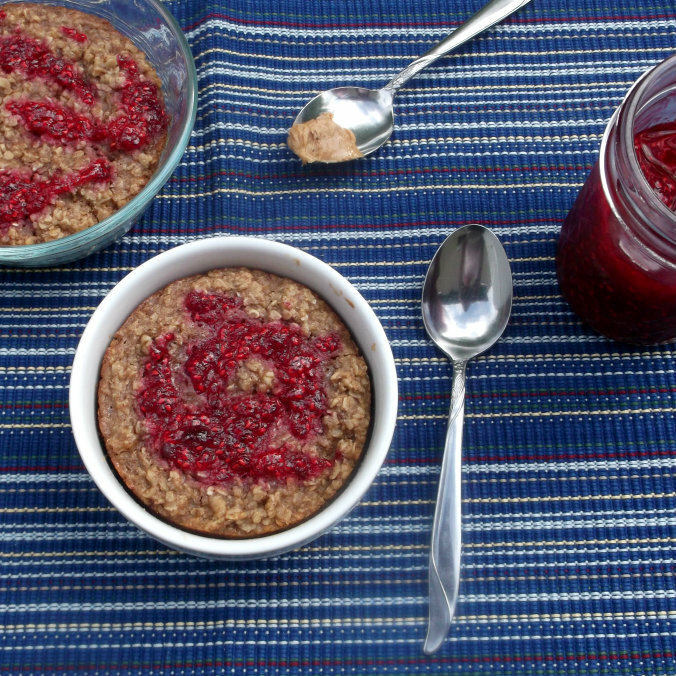 If you like peanut butter and jelly and oatmeal you will love this morning dish. 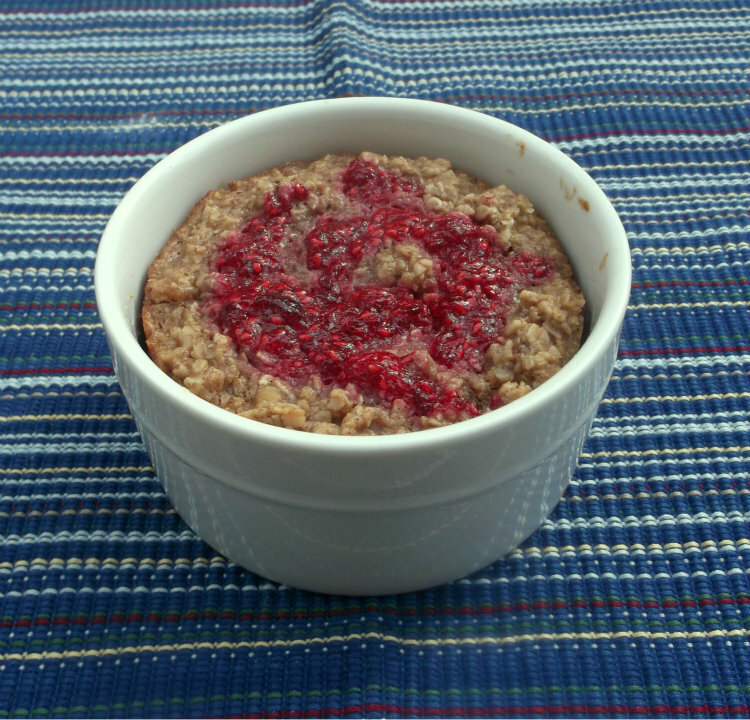 I have made a few of the baked oatmeal and I have to say that this one is my favorite so far. 1. Preheat oven to 350 degree F. Spray a single serving ramekin with nonstick cooking spray. 2. In a small bowl, mix oats, baking powder, cinnamon, and salt until combined. 3. In a medium bow; mix honey, vanilla extract, peanut butter, and 1 teaspoon of your favorite jam or jelly. Stir until well combined. 4. Add the dry ingredients to the wet ingredients and stir until well combined. 5. 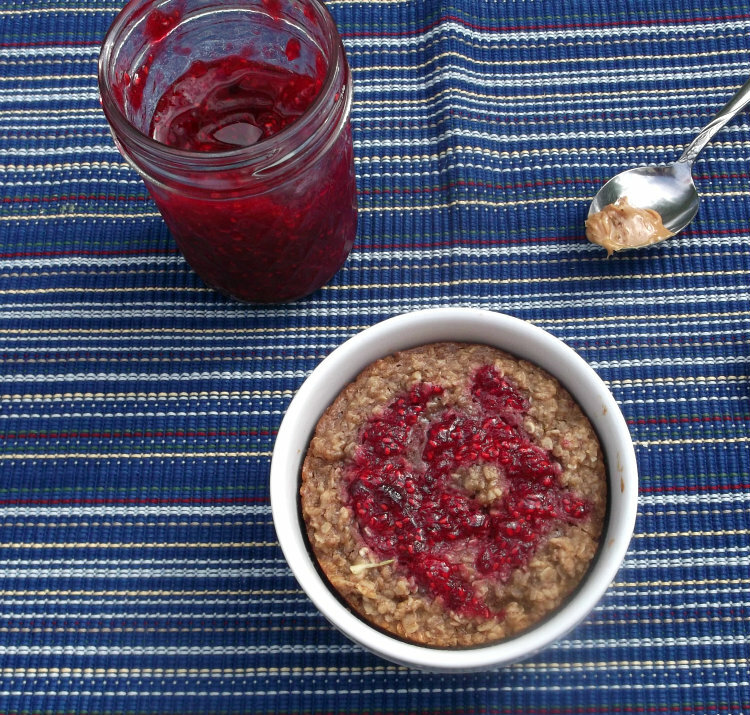 Pour into a prepared ramekin, then take jelly and carefully swirl it into the oatmeal. Bake for 18 to 22 minutes. My son would LOVE, LOVE, LOVE this! We’re well into warm weather, thank goodness. Although I was beginning to wonder what had happened to the sun! This looks terrific – who doesn’t like peanut butter and jelly? Never combined it in oatmeal, though, and I should. Great idea! What a great idea, making peanut butter and jelly oatmeal…I have oatmeal almost every morning…and this recipe is sure to inspire me to try different flavors on my oatmeal. Thanks Dawn!